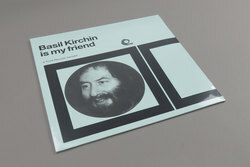 Basil Kirchin - Basil Kirchin Is My Friend – A Trunk Records Sampler. Vinyl LP. Bleep. The late Basil Kirchin left an indelible impression on the British musical landscape. Across genres as diverse as library music, film scoring, field recording, post-punk and ambient music, Kirchin’s unique ear for the potential of any sound places him in the same ballpark as other polymaths like Arthur Russell. The trick of this Trunk Records compilation is to bring together Kirchin’s disparate factions into a coherent whole. Basil Kirchin is My Friend plays somewhere between a conventional LP and a mixtape. Tracks like the cosmic punk-funk jam ‘Silicon Chip’ sit between processed recordings of found sounds, and the LP is peppered with snippets of conversation in which Kirchin explains some of his methods. As a whole, the album is a moving insight into a singular artist.